For a daily reminder to fill each day with love and purpose, hang up a beautiful piece of inspirational wall art from Ink Monkey Press. All of our prints are reproductions of original designs by Sherrie Lovler, a talented artist who has been selling her calligraphy art prints since 1985. They include famous quotes, poems, sayings and prayers that instill positivity and encouragement, which make them thoughtful and inspirational gifts for those you care about – especially for special occasions. Our inspirational posters speak straight from the heart and offer a chance for you to express the heartfelt sentiment you may find hard to express with words. With each design, Sherrie puts careful consideration into the balance and relationship between the words and images she puts down on paper, and the sentiment behind them. Each piece of giclee or lithograph artwork comes from an original calligraphy, hand-lettered design drawn from ink, watercolor and/or gouache, and is printed on high-quality archival paper that’s made to last. 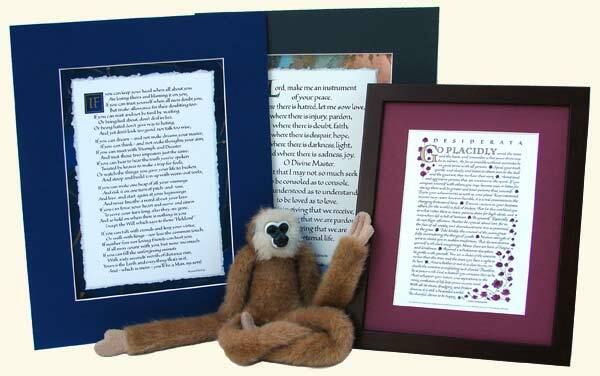 Browse through our matted or wooden-framed quotes and poems to find the perfect decoration for your walls, or a meaningful keepsake for a special friend or family member. 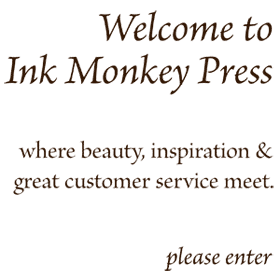 We can be reached at info@inkmonkey.com with any questions about our products or custom orders!